I was recently reading through Anton Gill's 1989 book "The journey back from hell" regarding the experiences of concentration camp survivors. I do realize, as is shown in this other question, that Jehovah's Witnesses wore the purple triangles. According to Anton Gill's book there were 6000 of them in the concentration camps and he says (on the same p.31) that "they attracted the special enmity of the Nazis". So I am not sure if these are the reasons why they had their own triangle color. For example, according to this Wikipedia article 2720 clerics were incarcerated at Dachau. The question I wanted to ask is: what color triangles were assigned to the members of other religious groups, i.e. those that were neither Jews or JWs? There is also an image/ chart on the site. 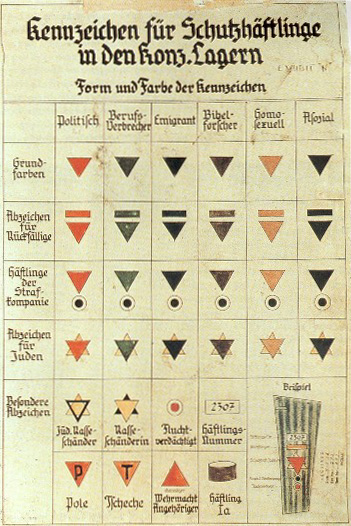 It is also shown on the Nazi concentration camp badge, which has quite a bit of other info concerning these markings. political prisoners: social democrats, socialists, trade unionists, Freemasons, communists, and anarchists. So it appears different color badges, but still within the original color selections, may have been applied to various religious denominations. Not the answer you're looking for? Browse other questions tagged world-war-two nazi-germany hitler holocaust or ask your own question. What were the 52 kinds of victims persecuted by the Nazis? Did Christians ever use crucifixion as punishment?